DuckDuckGo is a privacy-first search engine which doesn’t track you. I started using it as my primary search engine in 2011. Below is my first tweet about DuckDuckGo. In the tweet, I shared an article on an interview (2012) by TechSpot with DuckDuckGo’s founder, Gabriel Weinberg. My reason for using DuckDuckgo is I do not want search engines to track me by the things I search. And DuckDuckGo is one of the best alternatives. I am able to find things using DuckDuckGo more often than not. Bing? Meh. I have DuckDuckGo set as my default search engine in all the web browsers I use – Vivaldi, Firefox, Edge and Safari. Below is a list of features I use often. Bangs! Bangs! are commands to tell DuckDuckgo to search on a specific website. The ones I use most of the time is w! (Wikipedia). The others are ddgi! (DuckDuckGo Images), g! (Google), and gi! (Google Images). It is only when I can’t find anything relevant in DuckDuckGo then I have to revert to Google. To find out more about the “Bangs!”, check-out their Bang! page. For example, let’s see what Wikipedia has to say about my home country, “Malaysia”. In the DuckDuckGo search box, type “Malaysia !w” and hit <Enter>. You’ll be directed to the Malaysia page in Wikipedia. Cheat Sheets. There are occasions when I write in Markdown, or use Vim or tmux, I will need to refer to a cheat sheet. 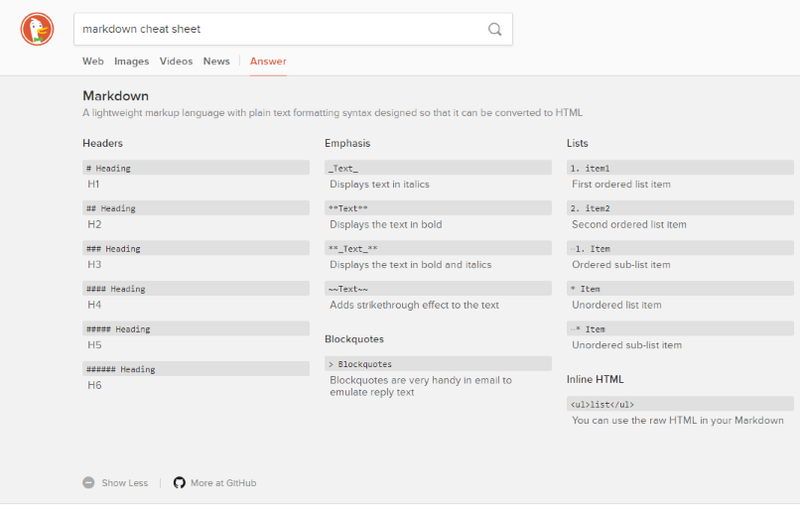 With DuckDuckGo, it will display the cheat sheet right above the search result. For example to view the cheat sheet for markdown, use the search term “markdown cheat sheet”. Instant Answers (or zeroclickinfo). Instant Answers are snippets of information which are displayed on the top-right of the search result. This helps especially when the result is relevant to the things I am searching. So there is no need to click any other results or scroll through the search results. From DuckDuckGO’s Wikipedia article, “Instant Answers are collected from 3rd party APIs or static data sources like text files”. So far from what I observed, the Instant Answers are from Wikipedia, Java docs (from Oracle), MDN Web Doc or the accepted answer from a Stackoverflow question. / — Cursor focus on the search box. If you are using Firefox, this doesn’t work because Firefox has mapped / to their “Find” which is also Ctrl+f. Unfortunately, there is no way to change this in Firefox. j or ↓ — Go down the search result list. k or ↑ — Go up the search result list. Although one may argue that Google’s search results are better. But for me, DuckDuckGo’s search results have been good thus far, if not better. 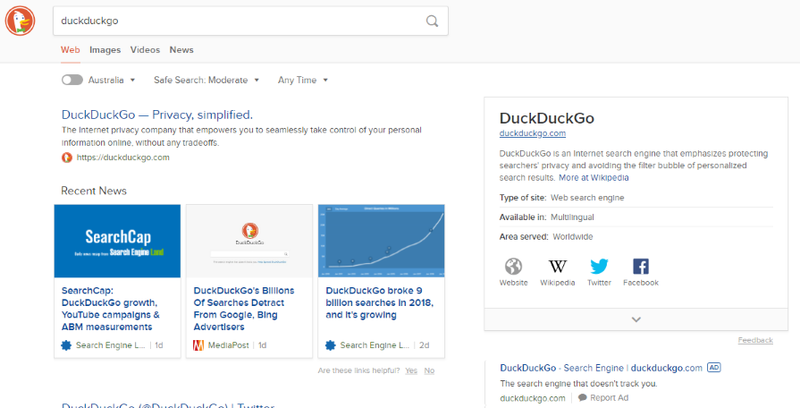 For other DuckDuckGo features which are not listed here, you can explore them at their features page. If you have not heard of DuckDuckGo nor try it, now is the time to give it a go. And let me know what you think?